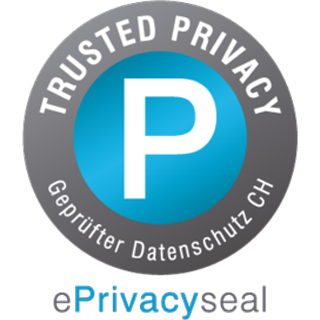 PrivaSphere is the first Swiss provider of a Secure Messaging Platform. The hosting location is Switzerland which is known for its sound data protection law. 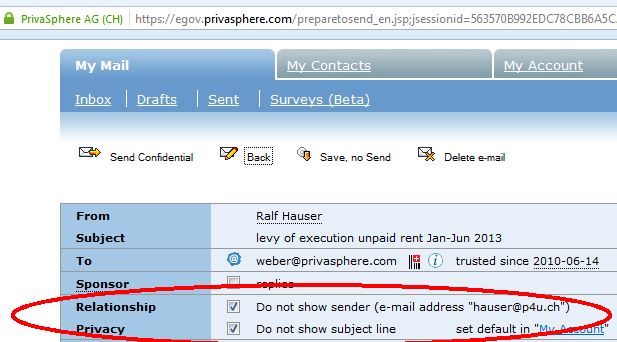 As a customer of PrivaSphere you entrust us your sensitive data. PrivaSphere endeavors to provide a professional service according to best practice security levels. Communications protected by at least 128bit secure socket layer (SSL) encryption. Simple user authentication with dynamic personal web of trust. Delivery of contents only if confidentiality is assured. Protection from Offline Password attacks. For Additional security, end-2-end encryption is encouraged through our service. Developed by PrivaSphere AG. The System is protected by the patent "System and Method for Secure Communication"
vers in different data centers. Backup is encrypted (GNUPG). The decryption key is not stored on the server. Class 3 SSL/SMIME certificates of the Swiss qualified (ZertES) Certificate Service Provider QuoVadis Trustlink Schweiz AG. Mail contents are not stored in plain text on the hard discs. The server equipment is behind dedicated redundant firewalls. 24/7 operations monitoring with alarming in case of failure. Strategic Partnership with iWay Communication GmbH (www.iway.ch) for hosting the PrivaSphere infrastructure. The datacenter is for optimum internet access integrated into the infrastructure of Interxion and is conform to Finma guideline 99/2 . Redundant second data center at a second site which has been certificated by SunTone as a highly reliable data center. Personal identification and assessment of staff with root access. Separation of root access and access to mail content. Service quality according to service level agreement. Processes are documented in an operations manual. Besides content confidentiality, the management of the trust relationship between sender and recipient over its lifetime proves to be as important: starting from the trust bootstrapping process to ease of use when established, to revocation and recovery in case of trust changing events and usability once it is established. PrivaSphere manages trust in all exchanges conducted by email and over the web. Validated recipient - no change of the trust relation has occurred. 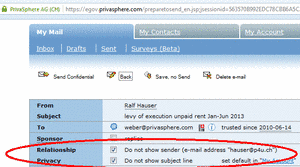 If a message is sent via the "secure contact me" or "prepaid return envelope" feature, trust level can not be determined. This user can no longer access the messages. The account has been closed - for example because this user works for a different employer and no longer is the owner of that e-mail address. The system behavior can be modified and the MUC can be suppressed, if the recipient is a participant of the secure messaging system and you are sure not to be mistaken about the eMail address. By clicking on ‘trust’, a recipient can be added to the personal list of trusted users. The protection against misdirection of information is suspended. Hint: Encourage your non-validated, non-participant recipients to become participants. If the recipient clicks on the quick register button, he can obtain a password, trust with the sender is established and a MUC is not any longer needed when communicating between these two parties. Registering only to receive does not have a cost impact for the user.